Do you have teeth gone missing or so decayed that they're mostly gone already? If so, you know how hard it is to flash a winning grin, as your unsightly teeth take the focus of your family pictures in a bad way. But at Tatiana Barton, DDS, your smile can be renewed through the implementation of dental implants, which are synthetic structures placed in the tooth where the root would normally be. Using this technique, Dr. Barton and her staff of trusted dental technicians can anchor specially-made implant(s) to your surrounding jawbone to serve as a strong starting foundation for an artificial tooth or permanent bridge to go on top of it, completing your smile's full restoration! 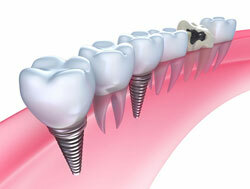 Implants are expertly made so they have the appearance of your natural teeth! Typically made from materials like ceramic or metal, implants won't leave anybody noticing the difference between your natural teeth. Preparing and placing your custom-made implant(s) does require surgery, and a period of time is needed after the procedure has been completed so the implant can attach itself to the surrounding bone tissue and be anchored in your mouth for the long haul. An artificial tooth is then placed atop the implant to give the full appearance of a natural tooth so you can start flashing that beautiful smile again with confidence. As long as you have the right bone density in your jaw and a strong immune system, then you qualify for dental implants! Patients who are willing to maintain a strict oral hygiene regimen that involves daily brushing and flossing as well as coming into the dentist for regular check-ups are especially qualified to experience the overwhelming dental solution that is dental implants. For more information on why dental implants might be the answer you're looking for for your mouth, give Dr. Barton or one of her trusted dental associates a call today at (203) 327-7390 for real dental answers right here in Stamford, CT! For more information on dental implant restoration in the Stamford, CT area call Tatiana Barton, DDS at (203) 327-7390 today!